The objective of this project was to further the understanding of the bed region of a black liquor recovery boiler. The net output of carbon dioxide from burning black liquor (a paper pulping by-product) is zero, making it a desirable alternative fuel source; however, there are other problems associated with burning black liquor such as boiler fouling, and emissions of pollutants. With the understanding gained from this project it will be possible to further improve the efficiency and emissions of black liquor boilers, making it a more viable fuel alternative. 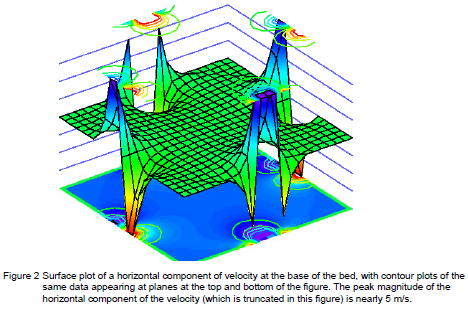 In order to attain the goals of this project, we created a bed model that simulates the conditions of the boiler using computation fluid dynamics. The fluid dynamics were modeled after Darcy’s law of flow through porous media, and were coupled with heat and mass transport equations. Using this model, we were able to make predictions regarding the air penetration depth and the temperature distribution of the black liquor bed. These results are important, because low oxygen content and uneven heat distribution can lead to the formation of undesirable particulates and gases, which lead to boiler fouling and poor emissions. 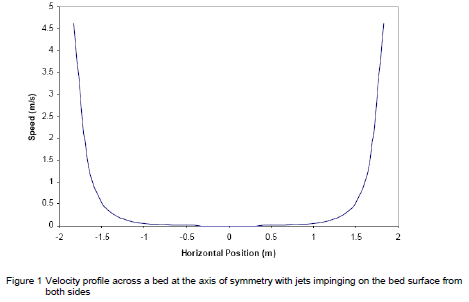 The Figures 1 and 2 below show the results for the air penetration depth into the fuel bed. From this research experience, I gained a better understanding of computational fluid dynamics, combustion and energy systems. The results of this research were presented and published in the June 2004 International Chemical Recovery Conference before a group of academic peers. The model created to perform this research will continue to be used for researching various aspects of black liquor recovery boiler operation.